Almost without fail when the possibility of new nuclear power stations at Hinkley or Sizewell are mentioned it is stated that ‘they will create 25,000 jobs’. The local paper called it a ‘jobs bonanza’ – however, it equates to the equivalent of 12 permanent jobs per year for local people over a nine year period. Where did they get that figure from? After several attempts I was eventually told it was from an EDF document1. It only includes construction work and not the people who may be employed full time if the plant is built. For a more detailed analysis see the link in this post. The above graphic can also be downloaded in pdf format. I have just done some calculations on Hinkley C Power Station. 20 billion invested in PV rather than Nuclear will produce five times more power than nuclear. 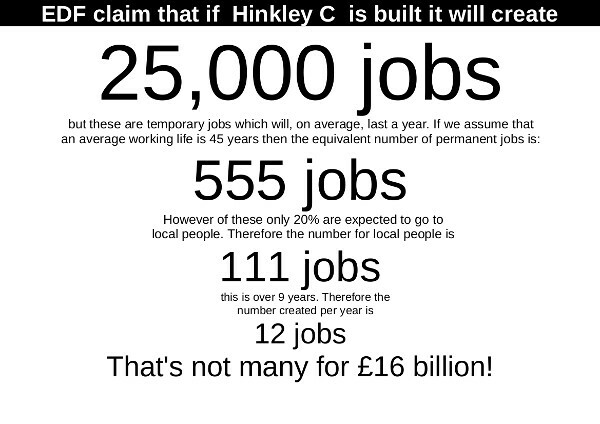 So why build Hinkley C with all that nuclear waste?